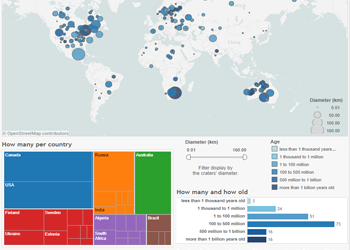 I recently had an opportunity to test the new spatial data connector in Tableau. It is a highly anticipated addition to the long list of connectors that allows you to work with ESRI Shapefiles, KML, MapInfo, and GeoJSON files directly in Tableau. The connector can interpret polygon and point entities (no lines as of yet) and is a big step towards making creation of maps in Tableau a much better experience. This long post is split into 2 parts, the first one describing preparation of data (which I did in FME) and the second part is about handling multiple shapefiles in Tableau to make the map work just the way we want it to. A little background about the project. I want to plot about 30,000 nonprofit organizations on a map of Washington State and classify them by the groups they belong to. 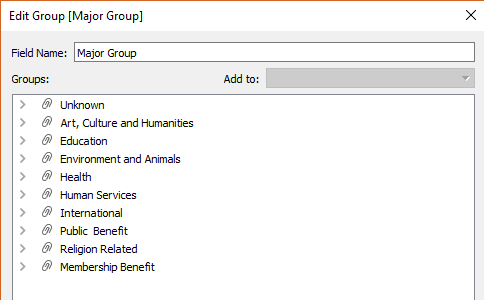 The data I got to start with contained the ID of each nonprofit, its name, along with address, including ZIP code, and a code that can be related to the desired grouping. What I wanted to end up with was a table with all orgs along with their lats and longs and corresponding county, congressional district and legislative district. FME to the rescue! If you haven’t heard of FME yet, it is a program developed by Safe Software. FME stands for Feature Manipulation Engine and it lets you create visual, drag-and-drop workflows to reshape or translate your data. Similar to Alteryx but focused on spatial data (and a hell of a lot more affordable than Alteryx). FME can be used to transform any type of data but it really shines when applied to tough spatial problems. Our project is not anywhere close to being a tough job for FME, so we’ll just be scratching the surface of what it can do. Performs and overlay of geolocated points on areas to assign each point attributes of the areas it is contained in. Outputs the final table of points with area assignments to a shapefile. 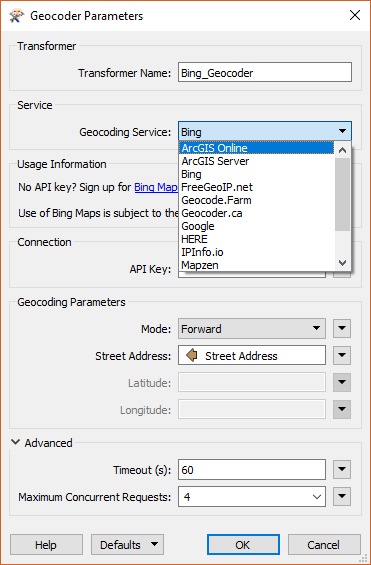 An additional note about geocoding options in FME. Although it’s not implemented in my workflow, FME has a Recorder and Player transformers that let you save to a file partial results of your workflow and replay it later in the same or another workflow. This is especially helpful when you geocode a lot of addresses and you don’t want to use up your quota by running the full workflow every time you make some changes and want to test it. The hard part is done, now let’s bring it all together in Tableau. I joined all 4 shapefiles, on the left the geocoded points, on the right, boundaries of counties, congressional districts and legislative districts. The join clause, in all 3 joins, is the name of admin area. Remember that we have admin area assignments in our point shapefile. I used full outer joins to make sure I could display boundaries of admin areas even if there are no points within them. Conversely, if some points fell beyond Washington state boundary, I want to know about it. Connecting a list of points as a shapefile, as opposed to text or Excel, is intentional. It solves a problem of significant data preparation that would otherwise be needed to create a combined polygon and point map. 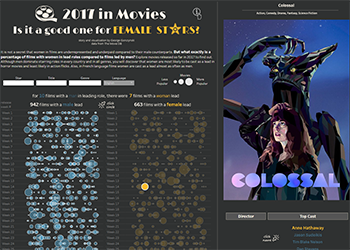 Tableau’s Alan Eldridge wrote excellent post about it, see the links in the resources section at the end of this post. Admin boundaries based on user selection. Level of detail based on user selection. Let’s pause here for a moment. 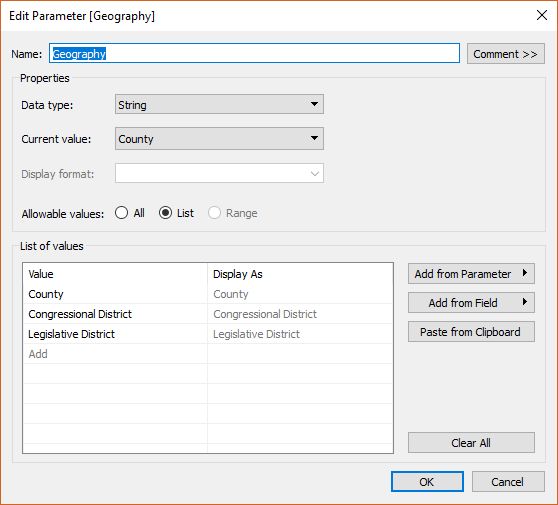 You probably have been wondering why we are bringing county and congressional district boundaries in; doesn’t Tableau have them built in? Yes, but we also need legislative districts which are not built in. 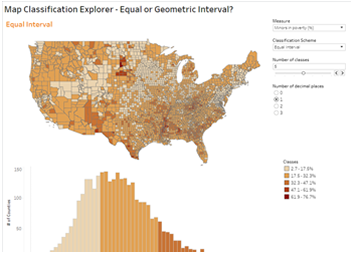 Tableau interprets built in geographic fields (State, County, etc.) as strings and the Geomtery field from a shapefile as type geometry. It would not let us mix the two types in the Level calculated field. Hence the need to keep everything consistent with shapefiles. To make the map, drag Geometry field from the nonprofit points shapefile (2015-501c3.shp) to canvas – Tableau will draw a map of all points. Put Names field (same data source) on Detail to separate the points into individual marks, this will allow tooltip display for each individual point. Duplicate Longitude (generated) field on Columns to create a dual axis map and put Level and Detail calculated fields on a Detail mark. Lastly, we need to create nonprofit groups based on Ntee Cd field, and place the group on colour. A few minor adjustments and we have an interactive polygon/point map with ability to switch between different administrative boundary options! With Tableau 10.2 it is easy to create polygon/point maps, including multiple custom geographies. 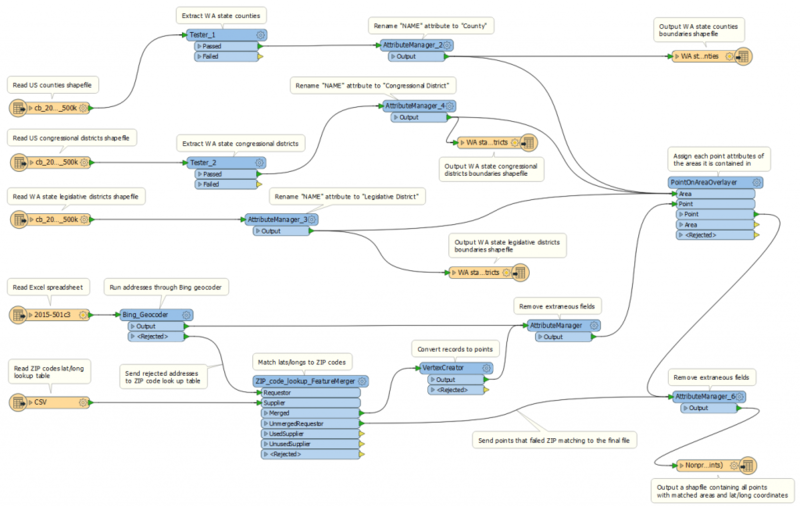 If needed, data preprocessing is a cinch with a tool like FME. I am just scratching the surface of what FME can do but I really got to enjoy working with it since I discovered the tool a couple of months ago. As I explore mapping in Tableau and discover FME, more blog posts are bound to come soon.